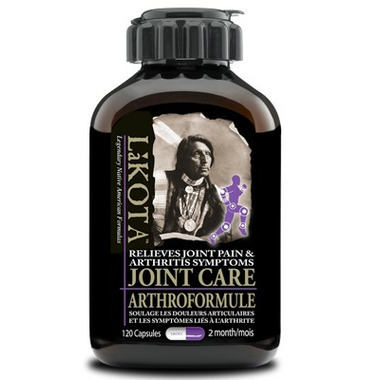 Lakota Joint Care Formula is a targeted multi-action, natural-source medicine for arthritis and joint pain. Lakota’s proprietary Joint Care Formula contains natural source pain relievers and anti-inflammatories. These ingredients are combined with nutrients that aid in cartilage repair in a convenient, single daily tablet or capsule that delivers effective pain relief. Directions: For long-term benefits and relief, this product should be taken everyday. Adults – Take 2 capsules twice daily with food. After four weeks of pain relief, take 1 capsules twice daily with food. Do not exceed 8 capsules per day. Use for a minimum of four weeks to see most beneficial effects. My son uses this along with turmeric to help with reactive arthritis. It works well for him. This is wonderful product for my dog and myself ! Amazing - it started working right away! At 70, I thought I would never fully recover from the fall that resulted in bursitis in my knee and would never be able to run again. I can now run as long as I don't go over 30 minutes. I am satisfied with that and believe that the Lokota Joint Care Formula had a lot to do with my recovery and being able to continue to run. Great product for my dog and myself ! I have been using this formula for almost two years now and love it. I have a lot of pain and limited joint movement, with swelling, when I do not take this formula. I reccommend this to everyone!